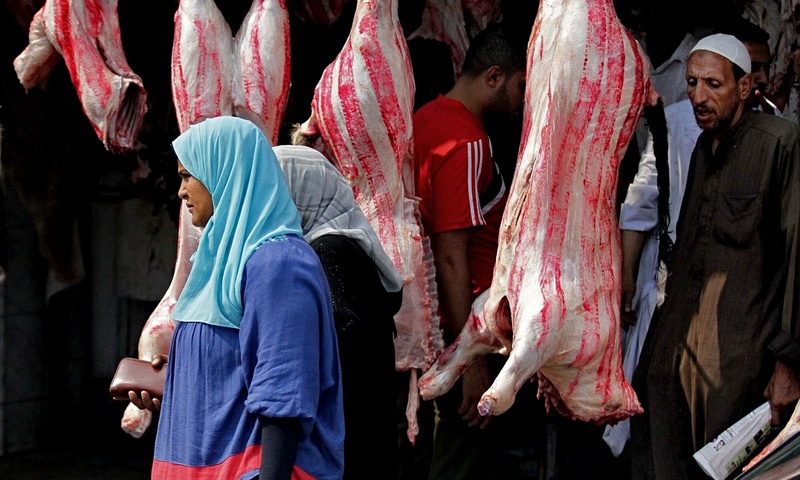 The governor of Cairo has ordered fines of up to 5,000 Egyptian pounds ($US 639) to be given to anyone found slaughtering animals in the street during the upcoming Eid Al-Adha holiday, Al-Ahram reports. According to the governor, Galal Saeed, killing animals on the street is detrimental to the surroundings and causes ‘inhumane conditions’. “We’ve been slaughtering animals in the street during Eid for years,” Khalid Karim, who owns a butcher shop in the Cairo district of Agouza, tells Egyptian Streets. Karim hopes the police will only fine people after the first day of the celebrations. “Let them walk down the streets to see where it’s not clean and then hand out fines,” he suggests. Eid Al-Adha – usually referred to as the feast of sacrifice in English – is a religious holiday celebrated by Muslims all over the world to commemorate the willingness of Abraham to sacrifice his son for God. Muslims usually sacrifice a goat, sheep, cow or a camel, donating some or all of the meat to the poor. Most people have their meat prepared by a professional, but some people slaughter the animals themselves, mostly on balconies, rooftops, gardens or in a public space. Eid Al-Adha starts on the 24th of September. The beginning of the Eid marks the end of the annual pilgrimage to Mecca.